Well, it’s finally happened. I have finally learned to say with honesty that I like Brussels sprouts. I have long wondered why I didn’t like them, given my extreme fondness for cabbage and other cruciferous vegetables, but for some reason I just didn’t find them appealing. Over the past few years I have experimented with preparing them several different ways, such as in a delicious cheesy dip or on top of sweet potatoes; the latter recipe was what inspired this new variation. I’ve made it three times in the past two weeks – serving it with pork, chicken and even as a standalone lunch – which just goes to show you how tasty this recipe really is! 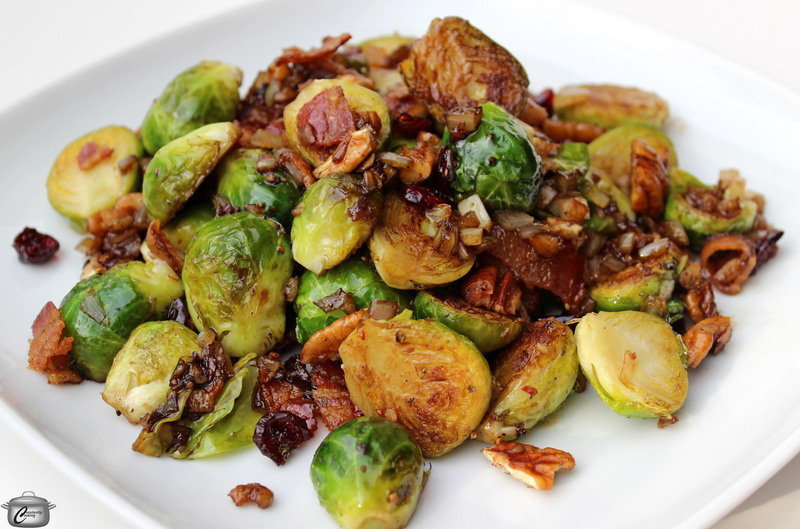 While bacon cooks, trim the stems of the Brussels sprouts, remove the outer leaves and slice in half from top to bottom. Put prepared sprouts in a heatproof bowl. Transfer cooked bacon from frying pan into a small heatproof bowl and set aside. Immediately pour the hot bacon fat from the pan over the trimmed and sliced Brussels sprouts. 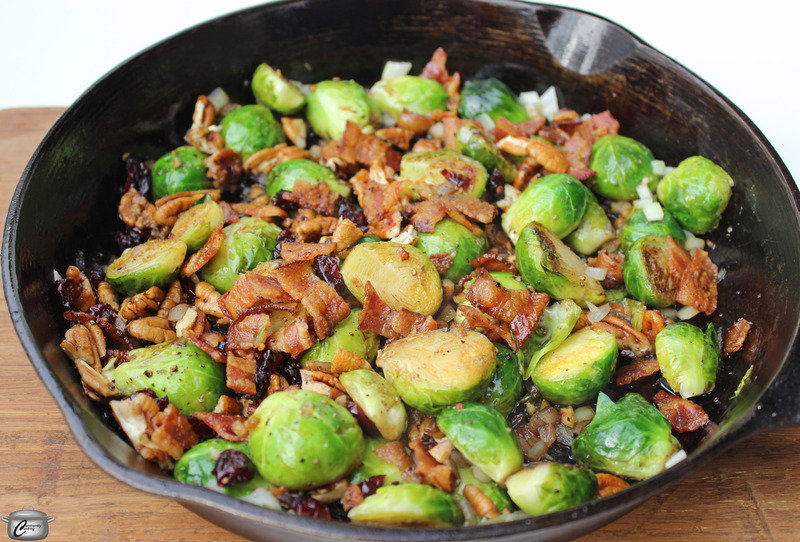 With a spoon, toss quickly so that all the sprouts get coated in the delicious bacon fat. The recipe can be prepared in advance to this point and left to sit at room temperature for a few hours. When ready to continue, heat the same large frying pan over medium-high heat for a few minutes, then place Brussels sprouts, cut sides down, in the pan in a single layer. If they don’t all fit, you’ll have to cook them in batches. Cook sprouts without disturbing them in the pan for about 3 – 4 minutes, until cut sides are nicely browned. Turn them over and cook for about 3 minutes more, until the largest sprouts feel tender when pierced with the tip of a knife. With the sprouts still in the pan (crowd them to one side), drizzle olive oil into the pan and add the diced onions. Cook, stirring gently, for 3 – 4 minutes, until onions have softened. If cooking sprouts in batches, transfer the first batch and the onions to a serving bowl and cover to keep warm, then cook the second batch. If necessary, return all the sprouts and onions to the pan if needed and stir gently for 2 minutes to reheat the first batch. Add the reserved bacon, cranberries and pecans to the pan and toss gently to combine. Drizzle with balsamic and cook for 1 minute, then sprinkle with salt and pepper. Transfer to serving bowl. These are best served hot but also tasty at room temperature. 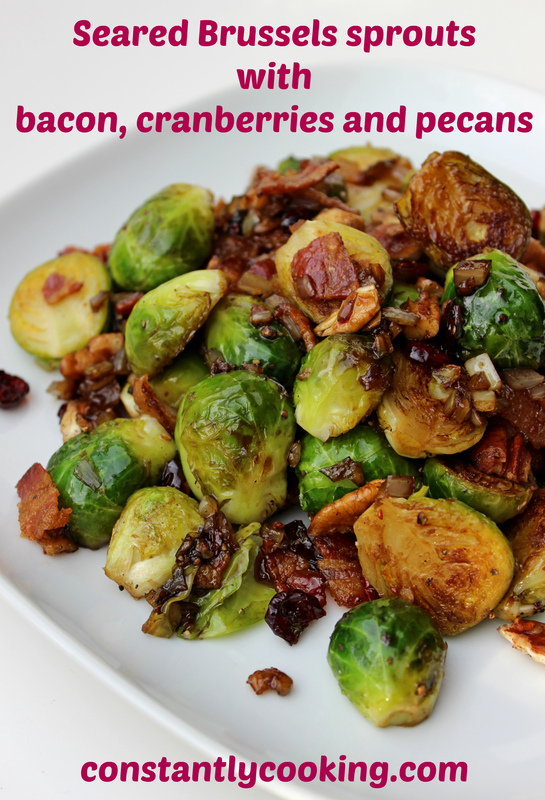 This entry was posted in Vegetables and tagged comfort food, how to prepare Brussels sprouts, Paula Roy, side dish, side dish for meat, tasty way to make Brussels sprouts, vegetables, winter food. Bookmark the permalink. Versatility must be your middle name, Paula! Mine’s William, but hey, I like yours better. I get lucky sometimes, Paula.